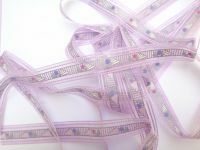 This is a lovely sheer lilac ribbon, 15mm wide with lilac edge stripes and a central, printed art deco style design of a flower and leaves in pink, green, white and blue. There are many uses for such a pretty ribbon, use it to decorate handmade cards and scrapbook pages, needlecraft projects it would work really well with our Purple Crochet Lace. Also available in other colours.